The American Jets, led by Riff (Matthew Hall, front), are ready to rumble in West Side Story. Photo Credit: Citrus Photography. 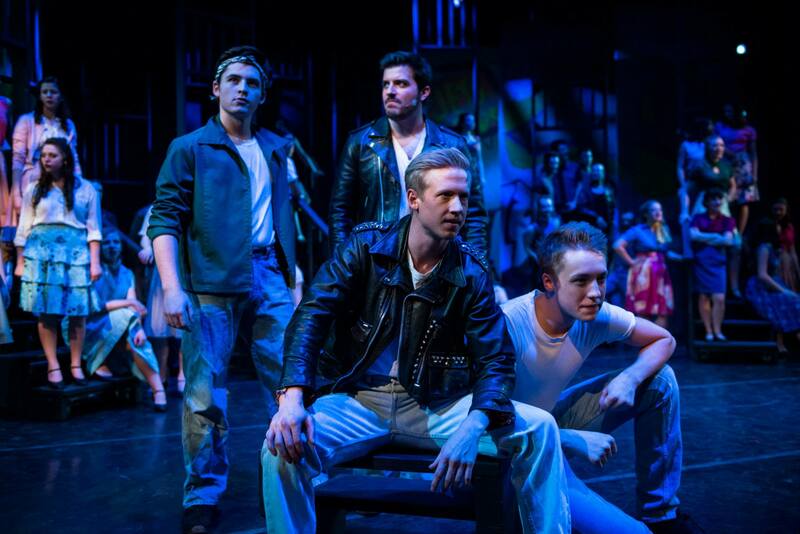 The latest production by the University of Calgary’s School of Creative and Performing Arts, West Side Story impresses with its musical score and social themes that are as relevant today as they were when the musical was first produced in 1957. Even with its great choreography and sound, however, this production of the classic Broadway musical leaves much to be desired when the music stops. Based on William Shakespeare’s Romeo and Juliet, West Side Story trades the Capulets and Montagues of fair Verona with warring street gangs fighting over territory in New York’s Upper West Side. Set in the 1950s, the American Jets, led by Riff (Matthew Hall), and the Puerto Rican Sharks, led by Bernando (Rufi O. Rodriguez), plan to hold one last, decisive fight between the two teenage gangs. Riff calls on a reluctant Tony (Ahad Mir) to come support the guys one last time. Tony agrees to help. Although, the situation becomes complicated when Tony meets and falls in love with Maria (Jocelyn Francescut), Bernando’s sister, at the school dance. When he sets out to stop the rumble at Maria’s request, Tony soon becomes more involved than he ever wanted to be. Dispersed across the theatre audience are five actors who open the show with the Prologue from Romeo and Juliet. The ‘Greek Chorus’ returns again, this time in black clothing, to close the first act, then the second with the Epilogue. It is a largely unnecessary addition to the musical considering this is not Romeo and Juliet. It may have been inspired by the Bard’s play, yes, but it is its own story that speaks to a whole different set of issues like immigration, racism, and at-risk street youth. Not to mention that the actors speak their lines out of sync with the others. While visually appealing, the colorful graffiti designs painted across the set are not period-appropriate. The graffiti is reminiscent of what came out of the hip-hop culture explosion of the 1980s. As such, it sits oddly against the very 50s feel and setting of the musical. Melissa Monteros and Wojciech Mochniej’s choreography is brilliant. The “Dance at the Gym” and “America” numbers see a lot of flair and excitement. The movement during the rumble and other fight scenes is sharp. There is certainly an edge to Monteros and Mochniej’s choreography. And thankfully, the students, alumni members, and community members involved in the production are up to task and dance wonderfully. (Although, not without some near collisions along the way). Leonard Bernstein’s memorable musical score is beautifully interpreted by Maestro Wendy J. Freeman and her orchestra. The orchestra plays superbly, giving us a very full, expressive sound. Unfortunately, in between musical numbers, the show runs a bit flat due to some uninspiring performances. Besides stand outs like Hall and Kayla Mackenzie who plays the fiery Anita, the remaining cast, for the most part, is lackluster. It is not until the second act that the ensemble seems to truly connect with the piece. Francescut gives an astounding vocal performance. Her voice is powerful, easily capable of filling the theatre, and simply beautiful in its clarity. It is too bad then that Mir’s own vocal performance never quite rises to the same level as his scene partner. Overall, the SCPA’s production of West Side Story is a strong effort. Audiences will find much to enjoy here, despite some areas that are lacking. The University of Calgary’s School of Creative and Performing Arts’ production of West Side Story runs from Jan 8 – 15, 2014, at the University Theatre.